I moved back to Greece in October 1973 with my parents after living in Canada for 7 years. I was looking forward to returning to my country of origin. We landed in Athens in the early morning. Of course there was no way I could sleep the first day. My father and I went downtown to have a coffee at the Syntagma Square in front of the Parliament building. Suddenly we heard some yelling and singing coming from one of the streets. We got up to see what was going on and walked right into a demonstration against the Junta governing Greece at the time. Whoa! What a way to be welcomed! I had a keen interest in the anti-war demonstrations in America from a very young age. I was very aware of political protest and violence. I saw the shootings in Kent State and the riots surrounding the ‘68 Democratic Party convention in Chicago on television, as well as the ’68 Olympics and the Black Power salute given by some American Athletes when receiving their gold medals on the podium. So here I was in the middle of this spontaneous eruption of protest in my own country. Tear gas, baton wielding police and demonstrations right before my eyes. I found it exhilarating. From that moment I knew that I wanted to be involved. Greece in Oct. 1973, the first month I spent a great deal of time wandering around Athens. I also kept coming up with every conceivable reason for not continuing my high school education… I refused to cut my hair and was not accepted for school in Greece (it was a dictatorship after all, thank goodness)… one day I passed by an English language bookstore. 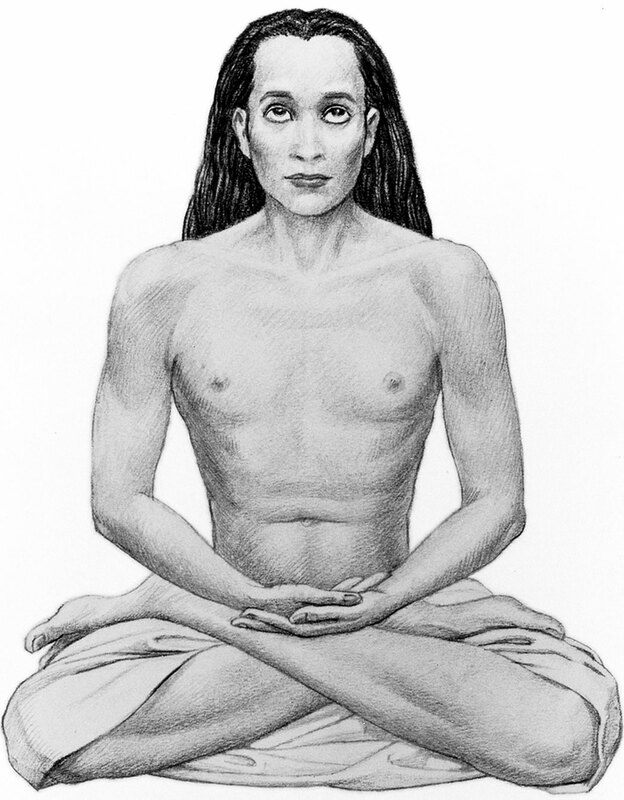 In the window prominently displayed was a book, “The Autobiography of a Yogi” by Yogananda. I was compelled to buy it. It is a thrilling story of someone’s personal awakening, quite phantasmagorical in nature but nevertheless it captivated my imagination and the expansive sense of what may be possible. There was one Guru described in the book as a thousand year old still living in the Himalayas, in a semi ascended state. In it he wrote that if you look into the picture and say his name with reverence you will get a direct blessing. So, with that thought in mind I took the book and sat down cross legged with it in front of flickering candle on the pitch black bathroom floor and began to silently call out his name. 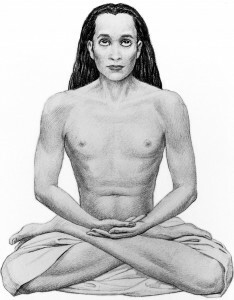 My previous attempts to sit cross legged and meditate did not last very long as I found it extremely uncomfortable. This time it did not bother me at all; after a while I stood up and felt no discomfort whatsoever. I looked at the time and realized I sat there for almost two whole hours. I went outside into a very busy street. There was an old wretched looking bus jam packed with people, with blue smoke that seemed to emanate from its every seam slowly making its way through the afternoon traffic jam. I began to feel very sad. I felt the weight, the age and the pain of that old bus straining to carry all those people, I looked into the headlights, and they looked like human eyeballs. Tears welled up in my eyes, and I ran back into my house. This can’t be right; I was supposed to achieve nirvana, or feel one with the universal “ohm” and all that but all I felt was the pain of the bus? I cried? Thus began my long and complex journey to realize that consciousness is not a personal experience disconnected from the environment. Consciousness cannot exist cut off from one’s suffering, or that of others, even if it be a wretched old bus… regardless of how the gurus of the world wish to market higher consciousness as some kind of eternal peace or constant nirvana state. Besides how can you fully appreciate the peace, or nirvana for that matter, without the experience of suffering and turmoil? Later the same day I decided to visit the National Museum just a few blocks from where I lived. I desired to look at something beautiful. As I walked to the museum I kept my eyes down not wanting to look at any more buses. I felt a bit silly about this. The intensity of the feeling was slowly dissipating and I felt like I wanted to save as much of the feeling of oneness as I could for the museum. I began walking up the steps of the museum with much excitement and trepidation. I turned into the first room and there stood this statue of Zeus called Artemisium. It was as if I was struck by a thunderbolt. I froze. I stood there staring at it for the longest time. There was something different about this statue. I then walked around and looked at many others but could not really focus on them. I went back to the statue of Zeus and stood still in front of it again. I stayed there staring at it, oblivious to my surroundings. An older security guard approached. “This is a very special statue” he said. I asked him “why?” “It is the only statue that does not bare all its weight on one leg,” he says. I looked closer and then I saw exactly what he meant. 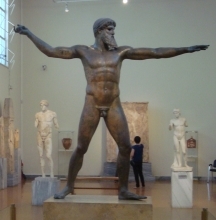 This statue’s pose was one of throwing a javelin or a thunderbolt in the middle of the action. It was caught almost like a photograph at the exact moment of throwing with both legs firmly planted on the ground, before the forward movement of the arm stretched back behind him began to throw the javelin or thunderbolt forward. We both continued to stand there looking at it. He stood there with me as if he too was seeing it for the first time, as he continued to speak. He told me he was there when the Germans entered Athens and he was one of the people who buried all the sculptures and valuable collection in sand in the side of the Museum grounds so the Germans would not find them. Many Athenians starved during the occupation and many others felt the need to collaborate with the Germans. But the Germans could not find anyone to tell them where the collection was hidden. He stared at it with the pride of a father; it was his favorite. After leaving the museum I went for a long walk. I began to notice the moment in my stride where both my feet touched the ground the split second where the weight is on both feet. I walked by the Polytechnic Institute and saw the students demonstrating within its walls. They were shouting for democracy and freedom handing out pamphlets and denouncing the military Junta in power at the time. I joined them. I stayed there for the rest of the day and returned every day to see the demonstration grow as many people joined in shouting anti government slogans, and singing banned songs of Theodorakis. By nightfall they had set up a radio station urging Athenians to support them. Athenians by the thousands came to the University and surrounded it to protect the students from possible attack by the military. On Nov.14 1973 the students at the Polytechnic Institute in Greece began a sit in to protest against some academic issues. It was quickly transformed into a full blown take over of the University grounds and the surrounding streets were filled with voices of dissent against the Junta. People began to gather from all over Athens and the surrounding areas. A radio station was set up to transmit and call out for everyone to participate, and openly broadcasting Theodorakis’ music. Theodorakis was a left leaning composer banned by the Junta. His music has a very deep resonance in the Greek psyche. He synthesized Byzantine ecclesiastical musical rhythms with traditional folk and classical music with pop over/undertones into songs of freedom and political action. By Nov. 16th 1973 at 8pm, there were more than one million people in the streets surrounding the university. Emboldened by our success and drunk with enthusiasm, we began our march towards the Parliament building. We did not get very far before there was a full blown police assault with tear gas and bullets flying all around us. I stood behind a pillar as people trampled over each other all around me trying to flee. I took a very circuitous route and made it back to the Polytechnic Institute by 10 o’clock. The students had barricaded themselves inside the university and chained the gates shut. They would not allow me inside. There were maybe 50 people left on the outside by this time; everyone had scattered. There were rumors that the tanks were coming. My father arrived. He had been searching for me for a few hours. He knew where to find me. Every day as this event unfolded I would leave in the morning and not return until much later in the night. He tried to convince me that there was nothing more to be done here and we better go home. It took a while before I saw the futility of my actions and the sight of him pleading with me was too much to bear. I was getting prepared by gathering bricks ready to fight the tanks and the army that was on its way. Finally I agreed. I grabbed my fathers arm, placing my body between him and the sniper’s position and said: “Well I’d like to see for myself how a Greek can shoot a Greek!” With that I pulled my father forward placing my body in front of the sniper’s position. We began to walk across. My father kept trying to tell me something but there was no way I would listen to anything he had to say at this point. I kept pulling him along. As we stepped on the side walk on the other side of the street, I heard a shot. We made it across safely. Unfortunately, two young men who witnessed our safe crossing also attempted to cross. Two shots rang out in quick succession. I turned just in time to see their lifeless bodies fall to the ground. Within seconds, an ambulance showed up and took them away. After a long walk with sounds of gunfire in the background, we finally made it home. In the days that followed, every time the news would mention the events I would start to tremble uncontrollably. I soon realized that I had to go back to that street. I felt that I missed something… I felt guilty for having caused the death of 2 people that followed my lead and tried to cross as I did. One week later I decided to go back. By this time they were arresting young people with long hair (mine was down to just above my waist) so I had my Aunt cut it. I convinced my father to go back to the Polytechnic Institute with me. The streets by this time were cleaned up, and there was police guarding the entrance to the University. The front gate was gone. The tanks had come, just after midnight… one of them drove right into the gate as the students were singing the Greek national anthem. The tank crushed a number of students that refused to move away from the front gate. I took my father’s arm again and proceeded to cross the same street. The trembling stopped. We walked slowly across. As I stepped on the other side on to the sidewalk, I remembered hearing the shot… I turned in the direction of the sniper’s position and saw the steel post of the stop light in front of me. At eye level, there was an outwardly facing bump on it. I moved around it to see the other side of the post. I could see the bullet hole on the other side of the steel post. The sniper did take the shot. The bullet was aimed straight for my head. The stop light steel pole had stopped the bullet. The two other pedestrians had no such luck. I write this as a tribute to them. I scoured the newspapers, death notices, nobody was reported dead on that street corner. I have no names for them. They, like many others simply disappeared. I on the other hand I have lived on, and have tried to live my life to the fullest. I can say that I have lived enough to fill at least three lives with experience and will continue to do so till I die. Perhaps my urge to write all this down is for those who cannot write for themselves. They each had their own stories that were left unwritten and unspoken. This book is my tribute for the two unknown pedestrians on that fateful night where the simple act of walking would somehow justify in the unknown sniper’s mind the use of deadly force. I added two photos that recreate this event. 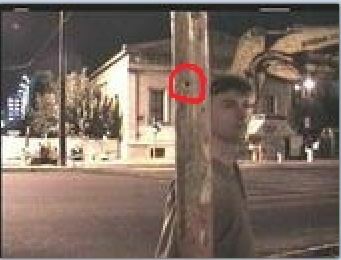 The metal post was about to be removed as part of the Olympic Games renovations Athens 2004. In the background is the Polytechnic Institute. We have the capacity to experience immense love, happiness, unbound creativity and invention, and expand our physical and spiritual capabilities… start today on your own walk across the sea of fear and into individual freedom. Freedom is the most precious commodity and we have absolute access to it at every moment of our life. Grab as much individual freedom as you can handle and keep coming back for more.